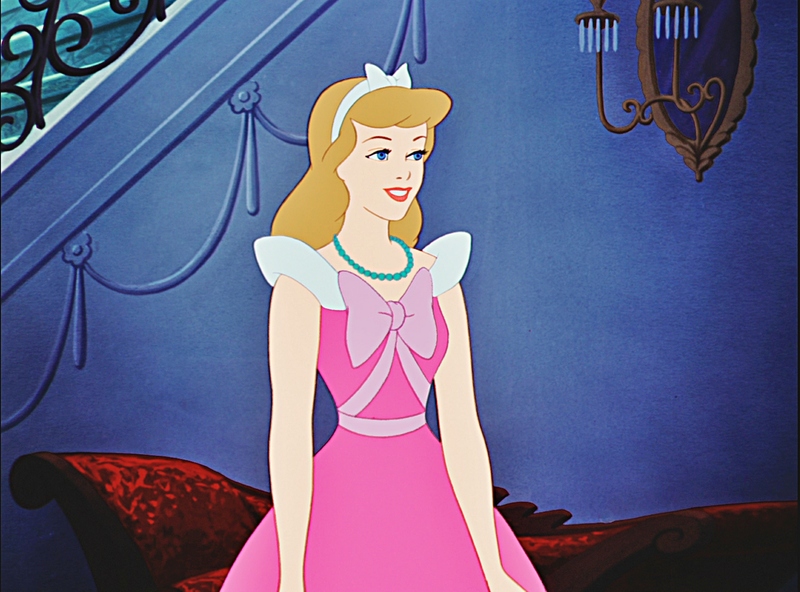 Disney has provided pop culture with some of its most memorable female heroines, from pretty and placid Cinderella and Snow White to feisty Ariel and Bella. They have also made a ton of money off of marketing these heroines, on backpacks and lunch boxes and every other product you could possibly imagine. In the last decade Disney Princesses have become a brand unto themselves, and last Sunday the group inducted their latest member, Merida, the star of 2012's hit Brave. You can see her in the lineup with her new cohorts above. Does Merida look a little different to you? She does to a whole lot of people, including blogger A Mighty Girl, who has put a petition on Change.org protesting Merida's new princess-ified makeover. Check out the side-by-side photo included with the petition, with the movie version of Merida on the right. Yeah, that's a pretty big difference. 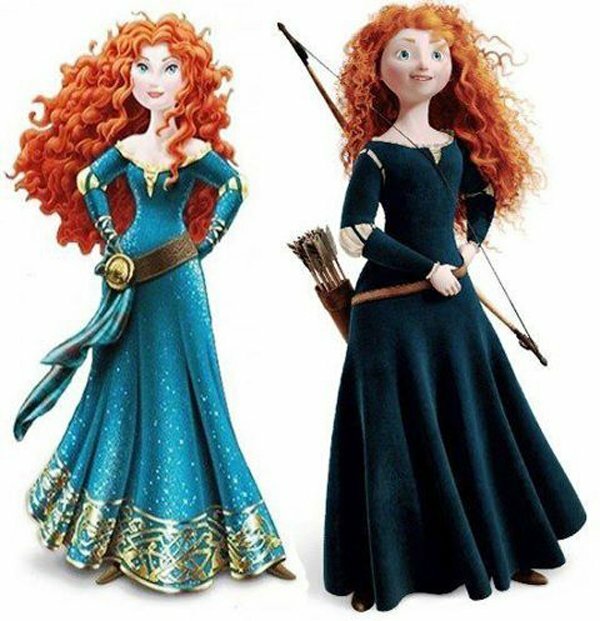 To put it simply, the Disney Princess version of Merida has been sexed up, given a thinner waist, a narrower face, and big eyes that are much more similar to a Bratz doll than to the usual characters designed by Pixar. The glittery dress that Merida is wearing here is most similar to that dress you see above, which Merida is forced to wear at the archery competition and which she completely hates. The Disney Princess brand has a knack for diluting the most interesting qualities of all its characters and shoving them into a generic princess box, overlooking the fact that Mulan wanted to be a soldier more than a girl in the dress, for example. But Merida's placement in this crowd, especially since the movie ends with her not marrying anyone and continuing to reject all the fancy trappings of princess-dim, seems especially galling. The grown-up makeover is just the firmest proof that the complete bland-ification of Merida has happened. I think it is atrocious!!! I'm all the way down in Santiago, Chile at a film festival, and this hits the fan while I am gone! It is outrageous! I've signed the petition and given Bob Iger a piece of my mind. Since I am no longer with the company, I'm sure they could care less what I think on the matter. But they have betrayed the essence of what we were trying to do with Merida - give young girls and women a better stronger role model. She's strong inside and out - she's not just a simpering pretty face waiting around for romance! She was created to turn that whole ideal on it's head! - Oh yeah... that's why I created her... they're just in it for the money... not the integrity. They don't care what message they send about women, as long as it makes them a buck. The transformation of Merida for the sake of the Disney Princess brand isn't all that different from what's happened to the other characters-- compare the version of Cinderella above to this one. But after Brave was heralded for its feminist sensibilities and its willingness to flip the princess model on its head, seeing Merida get lumped in next to Snow White and Sleeping Beauty-- exactly the retro princesses she was rebelling against-- is particularly depressing.